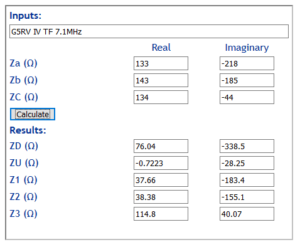 I measure ZC by connecting both leads of the twinlead together and measuring the impedance to ground. Next I connect wire 2 to ground and measure the impedance between wire 1 and ground and call this Za. Reversing the connections, by grounding wire 1 and measuring between wire 2 and ground gives Zb. 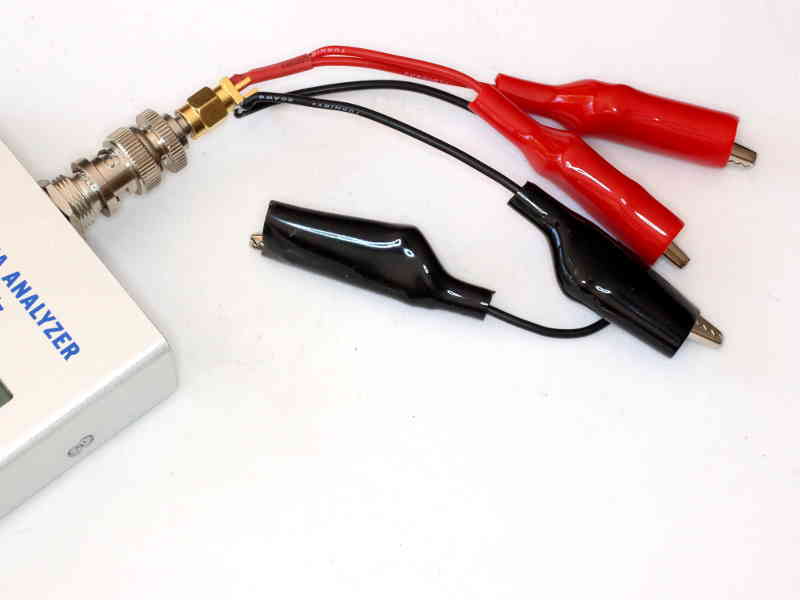 An adapter was used to allow measurement of Zz, ab, and Zc reported below. Above, it is attached to a FA-VA5 antenna analyser… the worst instrument I have ever used, but never mind, it might get fixed with firmware updates over the coming years… though experience says that is probably wishful thinking. The antenna system is a reasonably symmetric Inverted V configuration of the G5RV with tuned feeders, where the feed line to the point of measurement is 10m of 560Ω open wire line. 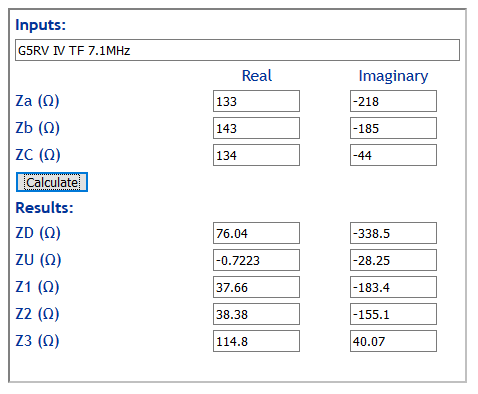 Above are the direct measured values and calculated results. The calculations are a bit tedious, a handy online calculator can perform them more conveniently. The unbalance impedance Zu is not trivial, though the real component is small, the imaginary component is significant suggesting that although the wires are symmetric, there is some asymmetry perhaps due to ground height variation, soil type, soil water content, vegetation etc. 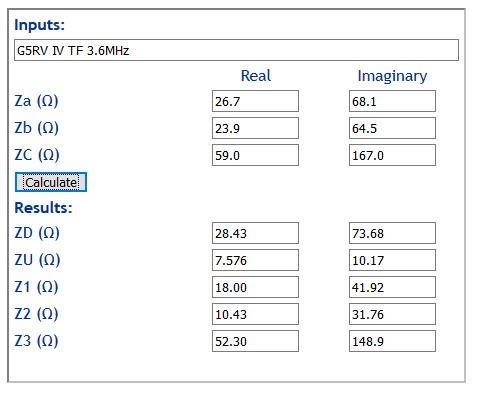 The unbalance impedance Zu is not trivial, and worse that the previous case. again a significant imaginary component suggesting that although the wires are symmetric, there is some asymmetry perhaps due to ground height variation, soil type, soil water content, vegetation etc. Readers will often see back of the envelope calculations of the effectiveness of a common mode choke. The article Using Ohms law on antenna baluns deals with some of the junk science that masquerades as fact. Some back of the envelope analyses assume the common mode driving voltage is that of a 50Ω unbalanced source, and the load is simply a common mode choke whereas if an ATU is between the 50Ω point and feed line, voltages and currents are transformed, the series common mode impedance of the ATU and any balun(s) are relevant as is ZC of the antenna system as measured above. To obtain valid results, the model must be valid, and that starts with including all of the elements that are relevant. Such a model can give a good prediction of the impact of a common mode choke of known Zcm at the point at which the measurements were made. Such models are complex, and mathematical (high school maths + complex numbers), but solvable with the requisite knowledge. A simpler approach is to simply directly measure the common mode current, and try common mode chokes with high Zcm to reduce it to an acceptable level. In most cases, the priority in addressing high common mode current is to examine the root cause, can the system symmetry be improved?